A Castle (complete with Tower, Bailey, Keep and Stables) in Holt, a Granary in the countryside and an Art Deco, funky home with uninterrupted sea views are just some of the new boltholes available from Norfolk Cottages for an autumn or winter retreat. With a tourist economy worth £3.25 billion and a record-breaking summer in terms of both soaring temperatures and holiday bookings, there’s no sign of the staycation trend slowing, with forward bookings for 2019 up by nearly 350% year on year. Here’s a cherry-picked list of what’s new for Norfolk. USP’s: An actual castle. Tennis court. 2 acres of private grounds. Additional interconnecting accommodation. Become King and Queen for the night in this new listing, one of five properties collectively known as ‘The Grove’ (sleeps 24). 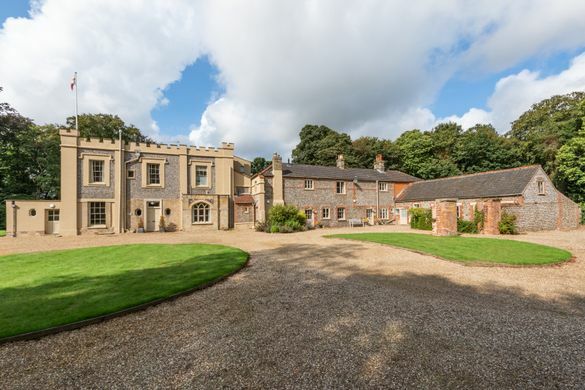 As centrepiece, The Castle is suitably elegant, a Grade II listed Regency style building which has been recently renovated with light and airy interiors and high spec fixtures and fittings. The kitchen table will seat 16, ideal if friends or relatives have booked the interconnecting ‘The Tower’ or ‘The Bailey’. The properties are set in 2 acres of private grounds with tennis court. Holt, known for its Georgian charm, art galleries, boutiques and independent shops is also home to the North Norfolk Steam Railway and the 100 acre Holt Country Park. Positively regal. Not your average barn conversion with quirky, individual features in every room: a tailor’s dummy replete with top hat and tails; vintage typewriters and cameras; even ancient hairdryers adorn the walls of one gothic bathroom. Whilst the interiors and bedrooms, all with a theme ranging from the ostentatious to country chic– ‘Gold Boudoir’ and ‘Red Putti’, to ‘Country Butterfly’ and ‘Blue Breton’ mean that no two rooms are the same, this luxurious, large property, brand new to the holiday lettings market, makes for the ideal ‘get-away-from-it-all’ Norfolk retreat. Livery is available 500 yards from the property if required, whilst 33 acres of private grasslands are yours to explore. Sea views don’t get better than this, with the cliffs and sea just beyond the picket fence at the bottom of the garden, from where you can watch the sun rise over Overstrand Bay on the north Norfolk coast. As buildings go, this is definitely an unusual one, 1960’s style, unusual lines yet enough glass to mean that the interiors are light and airy, making the most of the scenery. Unsurprisingly, given its location, there’s a nautical theme throughout. A woodburning stove makes for cosy evenings, pick up freshly caught sea-food from the local sea-shacks on shore. Price from £631 for a 3-night short break or from £841 for a week.